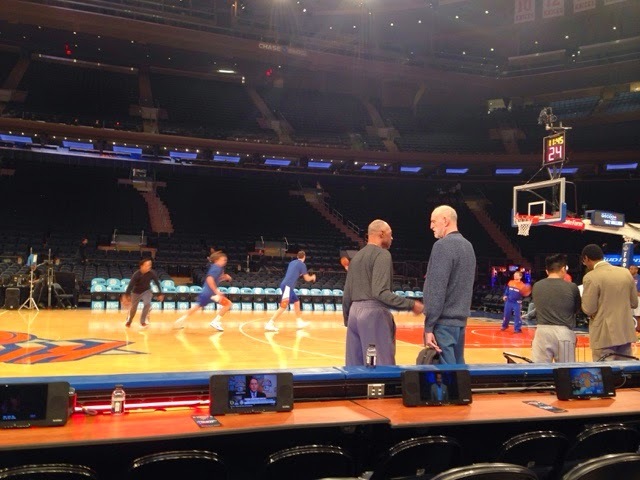 As I mentioned in my most famous column in July, I had never been to a Knicks game. I've lived in New York City for all of my 17 years and I had yet to go to one. Recently I've had multiple friends invite me, but due to various circumstances I've been unable to join them. And the tickets are so comically expensive for good seats that simply getting up to go to see the Knicks on a whim isn't something I've been able to do. That all changed last Saturday, and I wish it hadn't. 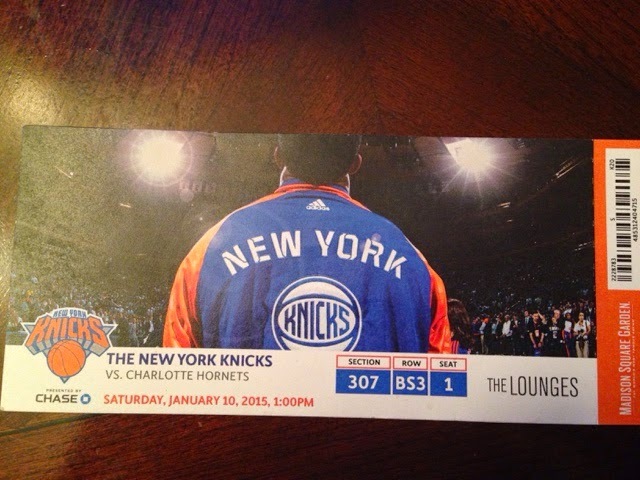 In September, a friend, colleague, and minor internet celebrity offered me the chance to see a game on January 10 against the Hornets from a suite, with warmup passes for the pre-game, for a little over a hundred bucks. That's a great price for that type of experience, so I pounced. Even better, I fell in love with the Hornets during the offseason, and it looked like they were primed for a great season. At the very least, they'd be one of the most fun teams in the NBA. I adopted them as my second favorite team in the league. Lance Stephenson, Al Jefferson, whatever P.J. Hairston is, and the potential of Noah Vonleh looked like a team that could restart the Hornets Era in Charlotte with a bang. Even better, there's a chance that I go to college on the outskirts of Charlotte, and I was so ready to spend four years heading over to the arena to catch a true contender. Well, that didn't happen. Stephenson simply isn't working out so far, and missed the game I was at. Jefferson did as well. This wasn't the Hornets team that I signed up for. As for the home team, that certainly wasn't the team that I expected. I bought the tickets expecting to see Carmelo Anthony leading the team in scoring, followed by J.R. Smith and Amar'e Stoudemire, pesky perimeter defense from Iman Shumpert, and lackluster interior defense from Samuel Dalembert. 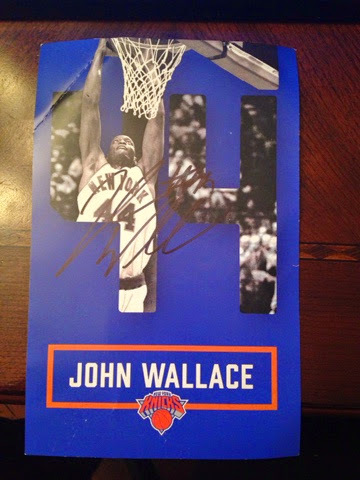 And the Knicks expected that as well, I mean, look at the back of the head that was featured on this ticket! A man who currently plays in Cleveland. Instead, as I got to our spot behind the benches for warmups, I was greeted by the sight of Lou Amundson on the floor. The man who was re-signed that morning after being waived immediately following his acquisition from the Cavaliers. This was not a nice feeling. Amundson is one of the most non-descript, space-eating, big men in the league. He doesn't do anything. He's just there. He just there with great hair. Guys like him, Tyler Hansbrough, and new teammate Cole Aldrich are basically useless guys who simply exist. There's nothing to them. Amongst fans, the feeling is different of course, because Hansbrough has earned his reputation as Psycho T, Amundson has his beautiful hair to keep him from anonymity. Aldrich has nothing, but we'll get to him later. After a rather un-exciting 20 or so minutes at floor level, including a lot of watching Quincy Acy jack up jump shots that he shouldn't be encouraged to take, it was time to head up to our seats. The view was pretty good, there was an abundance of food and drink waiting for us in the lounge, and we each got a Knicks drawstring bag with a T-shirt and cap inside. The first order of business was to bow down to the New York Rangers' 2013-14 Eastern Conference Champions banner hanging across from me. 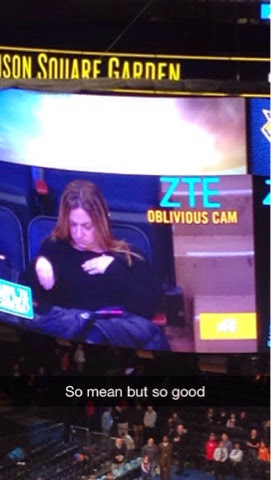 After this woman fidgeted, looked around, checked her phone, attended to a crumb that she thought she noticed on her shirt for over a minute, she finally looked up and noticed that the entire stadium had been staring at her. She was immediately followed by a couple that took a minute and fifty-four seconds to realize the big screen. This was incredibly fun. It was really messed up if you were one of the people featured on the Oblivious Cam, but fun for everyone else. Then the game started, and the fun ended abruptly. The Knicks sent out a starting lineup of Jose Calderon, Cleanthony Early, Tim Hardaway, Jr., Jason Smith, and Cole Aldrich. That being our first team is not what I expected back in October. It was during the first quarter that I made a pretty important observation about the Knicks and their roster. Cole Aldrich is not good at basketball. He's not one of those players like Tristan Thompson who has a redeeming quality in that he can crash the offensive boards with the best of them, I'm saying that Cole Aldrich has no legitimate NBA skill. I'm saying this because he has hands of stone on the offensive side of the ball. But that's not why he's here I guess. He's here to be a big body and take up some space in the middle of the lane on defense to deter all attackers. One issue: he's not good at that either. The amount of times I saw this man over-commit on the pick and roll, leave the paint too early and get embarrassed as a quicker guard blew right by him as he slowly began to set himself into a defensive position was sickening. He's supposed to be a help defender. But when a help defender is not standing between the offensive player and the rim, that's a major problem. The crowd was very into Langston Galloway when he entered the game. At that point it was only his second game in the NBA, and we were all pretty pumped about him after his great showing against the Rockets. And he was okay. He was pretty aggressive on offense and was not at all afraid of taking too many shots. In fact, I think that the Garden was well aware that he was the only player who had yet to piss off the fans to that point, as they used him on the giant video board in the pregame. Second game of his career, and he's by default a fan favorite. The score was 21-18 Hornets at the end of the first, and that was just about the last time I paid attention to the action on the floor. Every time I looked down at the court, someone on the Hornets, usually Kemba Walker, was scoring. At least the cookies in the suite were really, really good. Towards the end of the second, the PA announcer mentioned that the halftime entertainment would be a Kidz Bop Talent Show, to which I immediately yelled "that's disgusting." Outside of the Oblivious Cam, it was the best hting to happen all day until the fourth quarter. That's a really low bar, but the three kids that performed weren't totally devoid of talent, unlike the Knicks. During the beginning of the third quarter, I was more interested in sharing my NFL Picks that I had posted six hours earlier prior to leaving the house than in watching the game that was right in front of me. Why? Because the Knicks were down 62-31 at halftime and things were about to get worse. The quarter ended with the Knicks down 89 to 44. That wasn't a typo. I watched the Knicks get more than doubled up through three quarters by a team that was ten games under .500 at the time. Worst. First. Knicks. Game. Ever. Okafor chants filled the stands as we couldn't stand to watch this team anymore. Obviously the chants were in reference to Jahlil, but I think at this point I'd rather watch Emeka than anyone cuirrently on the roster. After watching Jason Maxiell put up 7 points and keep gettin' dem checks (seriously, how is he still in the NBA? ), we found salvation. Now that's not saying much of anything, because the Knicks are so bad. But when you hit three treys in a row when your team scored only 44 points through three quarters, you're going to become a fan favorite quickly. Don't be fooled though, I still hate Quincy Acy. I don't think he's much of anything. He should stop shooting so much. A man that attempted only 17 three pointers in 92 games prior to this season has already taken 18 this year. He's been good at it, but clearly he's not someone who has ever trusted his shot. Maybe he's added that to his game for the long term, but I doubt it. As for the game in general, the fourth quarter was better, but the fans were apathetic. Just because they scored 38 in the fourth doesn't mean we suddenly cared again. Scoring only 18, 13, and 13 in the first three quarters is what lost us. That 28 point loss felt like a 78 point loss. Immediately following the game, I bolted to the train to go to Hunter College to see the second half of my high school's homecoming game. They were down by 1 when I walked in, and lost to their bitter rivals (and a school that stole our team nickname) by 10 points. And that was the best basketball I saw all day. I'm not going to let that experience deter me from ever going to another Knicks game at the Garden, but damn that was a huge slap in the face. I waited ten years just to see that.